You've seen the film, read the books, watched the TV series, seen the play: now go see another play about the most overexposed Victorian duo since Gladstone and Disraeli went skinny dipping. We're literally on the very fringe of the Camden Fringe - the border with Haringey is just metres away - Upstairs at the Gatehouse. 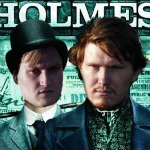 The Holmes and Watson (played by a sparkling Peter Davis and Matthew Woodcock) embark on their most ludicrous adventure yet, feeding all existing Conan Doyle stories into a boxy computer and acting out the ensuing masterpiece: The Case of the Porcelain Tongue. The plot, such as it isn't, throws up all the usual Holmesian themes - a country estate, a dubious love affair, and a touch of mistaken identity (could there be a link between Mr Hodley Blackstone and Mr Blackly Hodstone?). Nearly all parts are played by Woodcock and Davis, resulting in some comedic costume changes. The only exceptions are housekeeper Mrs Hudson, ably portrayed by a glove puppet with a harsh Brooklyn accent, and a mute female character who is drawn from the audience (ladies, avoid the front row if you're stage shy). This is genuinely funny, fast-paced stuff. Hook-nosed Davis and moustachioed Woodcock deliver a silly but affectionate take on the Holmes superlegend. There's room for a bit of honing in the script and not every gag hits home. But such is the pace and charm, we hope they crank up the Conan Doyle computer for a fresh adventure soon. Sherlock (Abridged) plays Upstairs at the Gatehouse tonight and tomorrow (9-10 August) at 6pm. Tickets £7.50.